Many experts believe that gasoline taxes should be increased for a variety of reasons. Their arguments are unpersuasive. Oil is not disappearing, and when it becomes more expensive, market agents will substitute away from gasoline to save money. The link between oil price shocks and recessions, although real in the 1970s, has been much more benign since 1985 because of the termination of price controls. Market actors properly account for energy costs in their purchasing decisions absent government intervention. Pollution taxes, congestion fees, and automobile insurance premiums more closely related to vehicle miles traveled are better remedies for the externalities associated with automobile travel than a simple fuel tax. Gasoline consumption does not necessarily distort American foreign policy, impose military commitments, or empower Islamic terrorist organizations. State and federal gasoline taxes should be abolished. Local governments should tax gasoline only to the extent necessary to pay for roads when user charges are not feasible. If government feels compelled to more aggressively regulate vehicle tailpipe emissions or access to public roadways, pollution taxes and road user fees are better means of doing so than fuel taxes. Regardless, perfectly internalizing motor vehicle externalities would likely make the economy less efficient -- not more -- by inducing motorists into even more (economically) inefficient mass transit use. 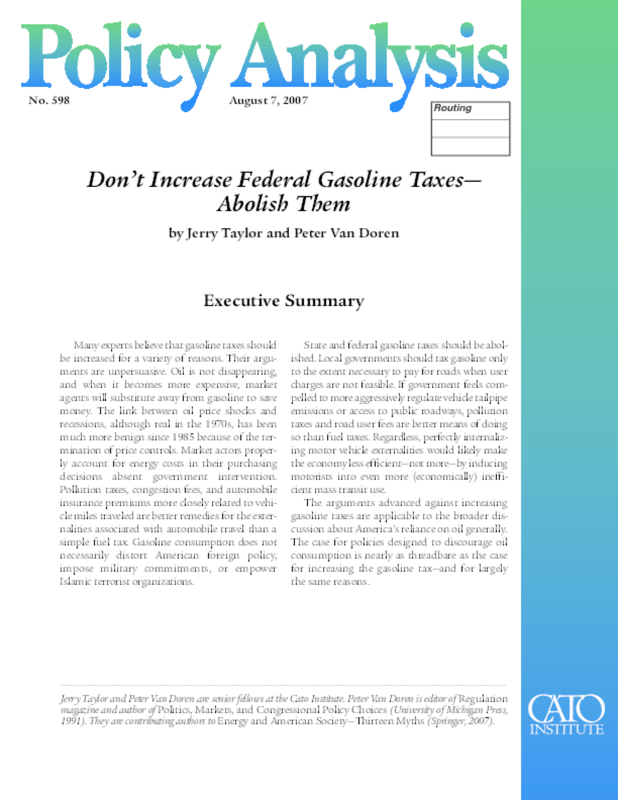 The arguments advanced against increasing gasoline taxes are applicable to the broader discussion about America's reliance on oil generally. The case for policies designed to discourage oil consumption is nearly as threadbare as the case for increasing the gasoline tax -- and for largely the same reasons.